people learning at work rely on social, or informal learning, around 80% of the time. Interestingly, I noted in a former post, Social Learning and Exception Handling, that John Hagel and John Seeley Brown contend that “as much as two-thirds of headcount time in major enterprise functions like marketing, manufacturing and supply chain management is spent on exception handling.” It is not coincidence that the two numbers are aligned. The most basic point to remember is that exceptions to formal business processes require efforts to design a scalable learning architecture that supports content co-creation needed to adapt to emergent challenges and manage the flow of that adaptation through an enterprise’s ecosystem. Whether judging an adaptation successful requires it to result in new formal learning content, i.e. content co-creation, or a new business process, i.e. 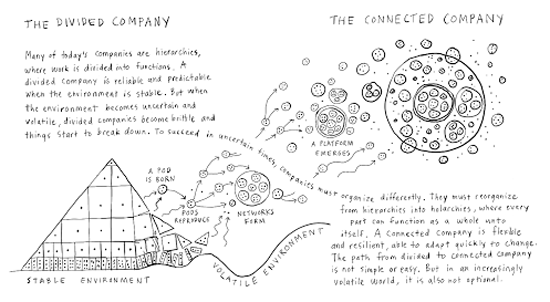 organizational innovation, or both, remains an open question. Informal, social learning is key to exception handling since both make up most of what people do in organizing work in enterprises. Of course, for every generalization there is usually an exception. My posts on business exceptions to this point largely focus on Barely Repeatable Processes (BRP) where informal and social learning assists employees solve issues raised by the need to improvise and handle exceptions to maintain a good customer experience, or solve issues experienced by other stakeholders such as business partners, suppliers, etc. Recently, while reading General Electric’s A Connected World blog, one case described there led me to think about informal learning and collaboration with a different twist. It caused me to reconsider exceptions and look at the way attempts to make processes better by using working knowledge learned informally also produces exceptions in some organizational contexts.